The flu season is officially upon us. According to the Centers for Disease Control and Prevention (CDC), flu season began in October and will continue to affect the U.S. as far out as May, becoming the strongest between December and February. Influenza—commonly known as the flu—is a respiratory virus that can infect the nose, throat and lungs. Though anyone can catch it, the flu and its complications (e.g., bacterial pneumonia, sinus infections, etc.) can be especially dangerous for certain groups of people, including those over 65 years old, pregnant women and children. About 5 to 20 percent of the U.S. population will catch the flu, and 3,000 to 49,000 will die from flu or flu-related complications. Many experts believe that the flu is spread through tiny droplets of fluid when people with the flu speak, sneeze or cough close to another person. The flu may also be caught by touching a common surface (e.g., a doorknob, a table, etc.) with the virus, then touching your mouth, nose or eyes. How can you keep the flu from getting to you? No matter what you may hear from others, the flu shot cannot give you the flu because it’s created with dead pieces of the virus. Though it may not be 100 percent effective, it is the best way to protect yourself and those around you from spreading the disease. In fact, during the 2012-2013 flu season, an estimated 45 percent of the U.S. population got vaccinated, helping to prevent an estimated 6.6 million flu-related illnesses, 3.2 million flu-related medical visits and 79,000 hospitalizations. Keeping your hands clean is one of the best ways to keep the flu away. Wash hands vigorously for 60 seconds using soap and warm water several times a day, especially after spending time in a shared space (e.g., an office, school, etc.) to stop the spread of germs. 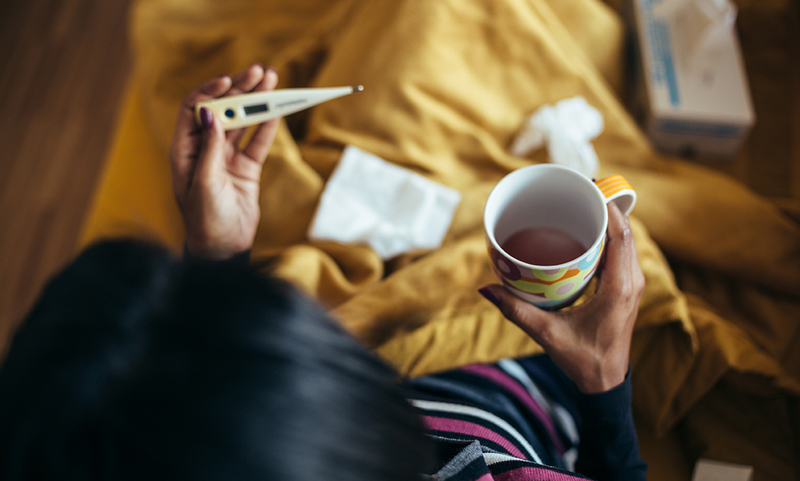 As one of the leading healthcare plan providers in the Baltimore area, we understand that taking a day off can be tough, especially if you’re a parent and need to reserve your time off for when your kids get sick. That said, taking time off not only keeps your germs away from others, but it also keeps you from their germs and allows you to rest for a speedier recovery. This seems easy enough, but the reality is that some otherwise healthy adults may be able to infect others with the flu beginning one day before symptoms start and up to five to seven days after becoming sick. So, if you see or know someone feeling under the weather, avoid close contact with them as much as possible. One of the keys to avoiding the flu—or any disease—is by practice healthy habits every day, such as drinking plenty fluids, eating fruits and vegetables and exercising regularly. By doing healthy things, your body and its immune system will be strong against diseases like the flu. For more information about the flu and flu prevention or to find a doctor to care for your needs, contact us today. Posted November 20, 2017 by Melissa Ruppel & filed under Uncategorized.